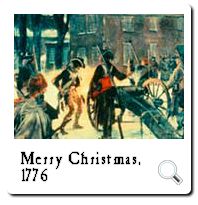 Trenton, New Jersey, 26 December 1776. General Washington here matched surprise and endurance against the superior numbers and training of the British, and the Continental Army won its first victory in long months of painful striving. 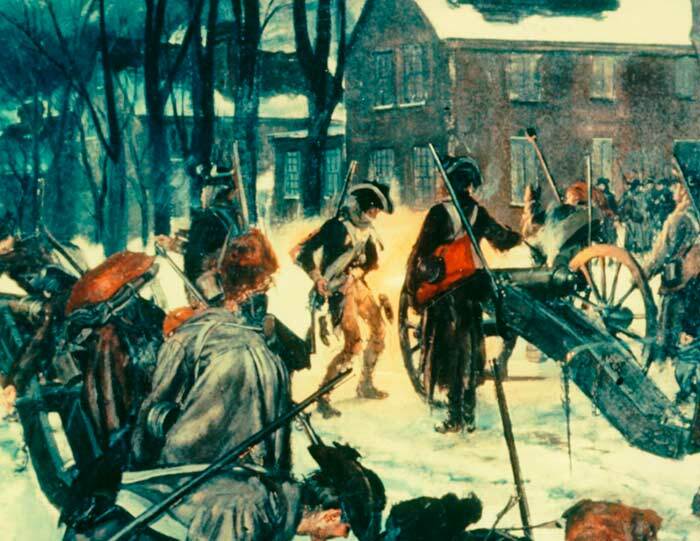 Trenton eliminated 1,000 Hessians and drove the British from their salient in New Jersey. It saved the flagging American cause and put new heart into Washinton's men. Alexander Hamilton's Company of New York Artillery (now D Battery*, 5th Field Artillery) opened the fight at dawn, blasting the bewildered Hessians as they tried to form ranks in the streets. 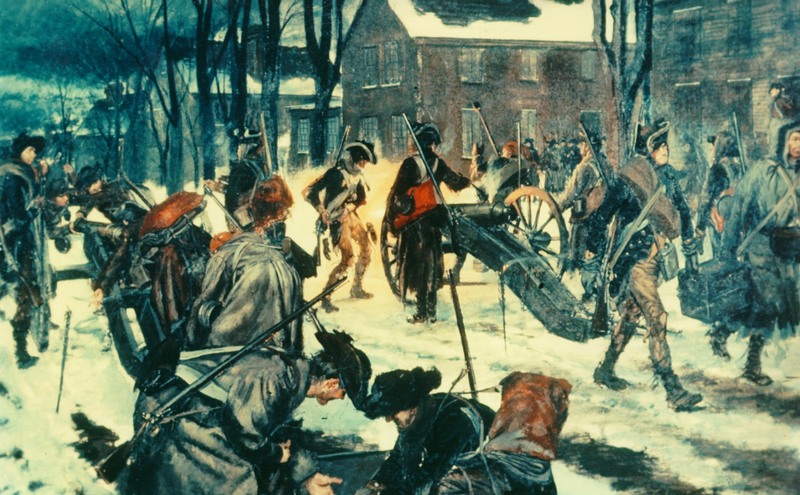 *While this may have been true when the caption for this painting was written, a reorganization and redesignation changed the unit's designation to 1st Battalion, 5th Field Artillery, which today carries the history of Alexander Hamilton's artillery company. 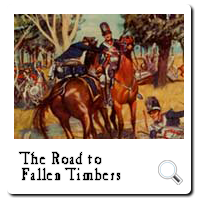 "The Road to Fallen Timbers"
Banks of the Maumee, Ohio, August 1794. 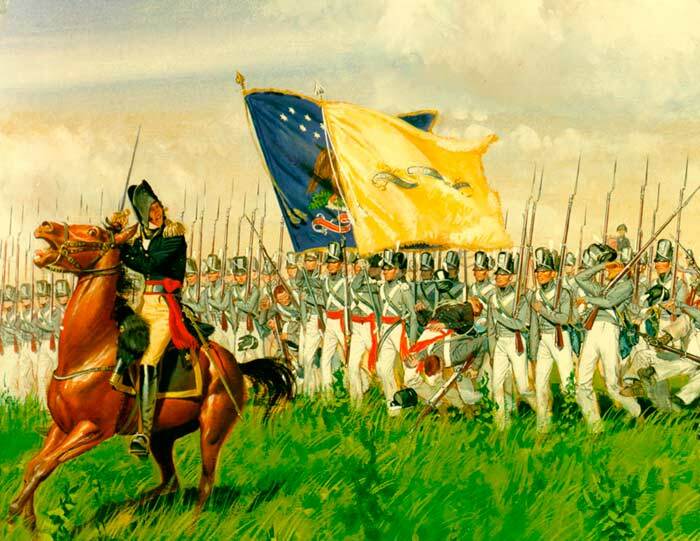 Anthony Wayne commanded the Army, enlarged in 1792 and formed into the Legion (now 1st and 3d Infantry Regiments). He trained it into a tough combat team to beat the Indians of the Northwest who had twice whipped us. The Legion advanced into Indian country, feeling its way cautiously. On 20 August 1794 it tracked down the foe, routed him from behind a vast windfall, and destroyed his warriors. Thus the way cleared for the new nation to expand into the Ohio Valley. 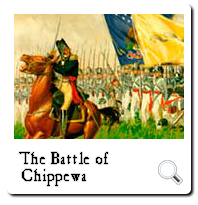 Chippewa, Upper Canada, 5 July 1814. The British commander watched the advancing American line contemptuously, for its men wore the rough gray coats issued those untrained levies he had easily whipped before. 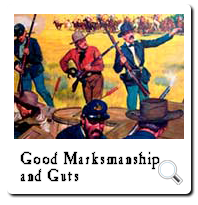 As the ranks advanced steadily through murderous grapeshot he realized his mistake: "Those are regulars, by God!" 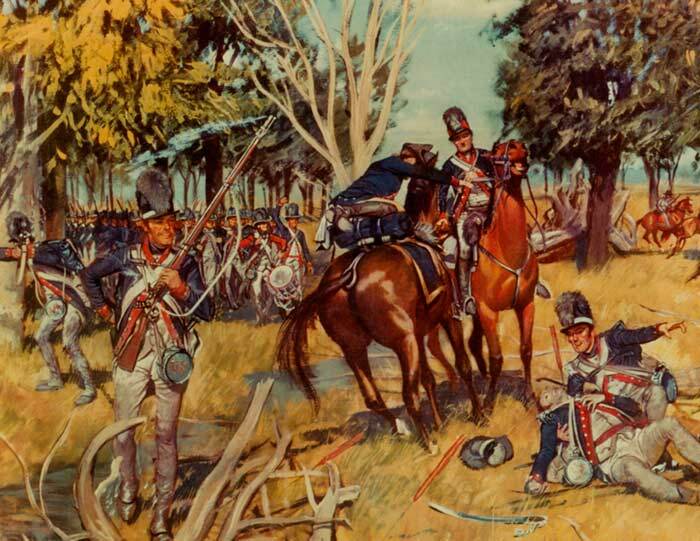 It was Winfield Scott's brigade of infantry, drilled through the previous winter into a crack outfit. It drove the British from the battlefield; better still, after two years of seemingly endless failures, it renewed the American soldier's faith in himself. 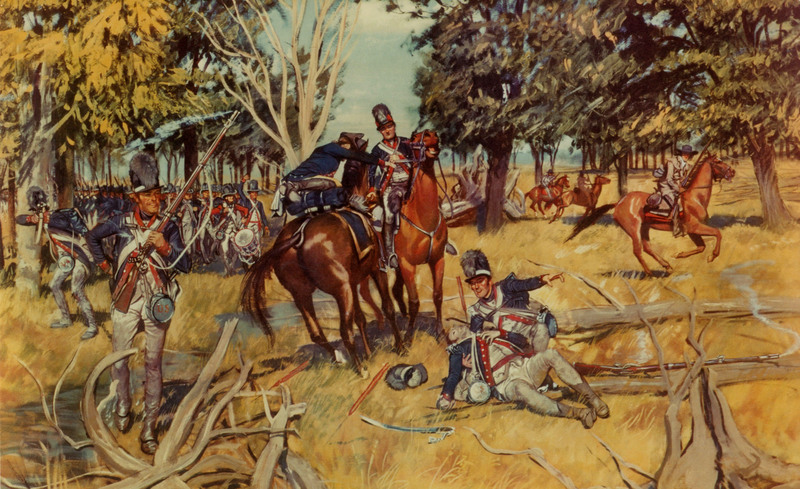 Resaca de la Palma, Texas, 9 May 1846. Here Captain Charles A. 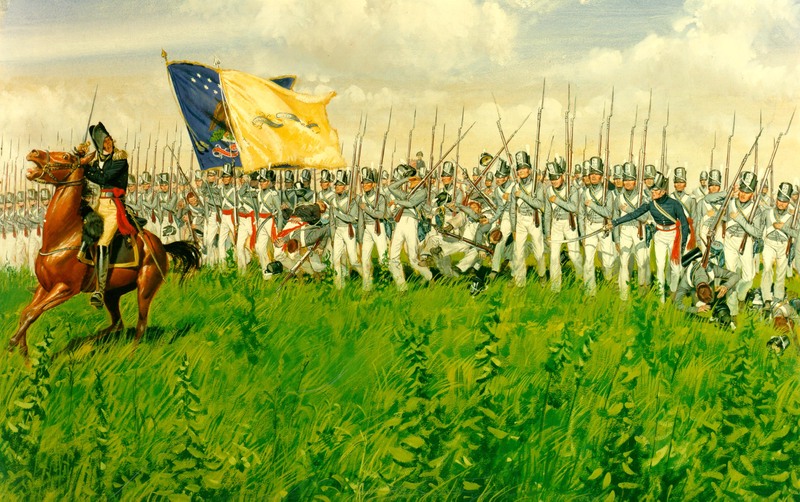 May's squadron of the 2d Dragoons (now 2d Armored Cavalry Regiment) slashed through the enemy lines in an attack that climaxed the opening campaigns of the Mexican War. 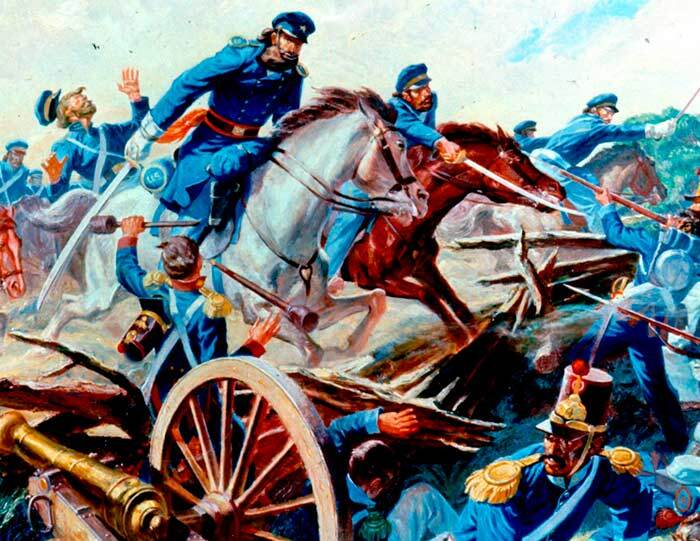 Their bravery proved that the 2,500 American soldiers under Zachary Taylor had enough self-confidence and pluck to shatter the Mexican force of 6,000 and eject it forever from Texas. Thereafter throughout the war our Army never lacked daring. 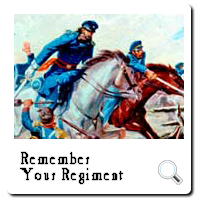 May's attack order was simple and effective: "Remember your regiment and follow your officers." Confederate Lines, Vicksburg, Mississippi, 19 May 1863. 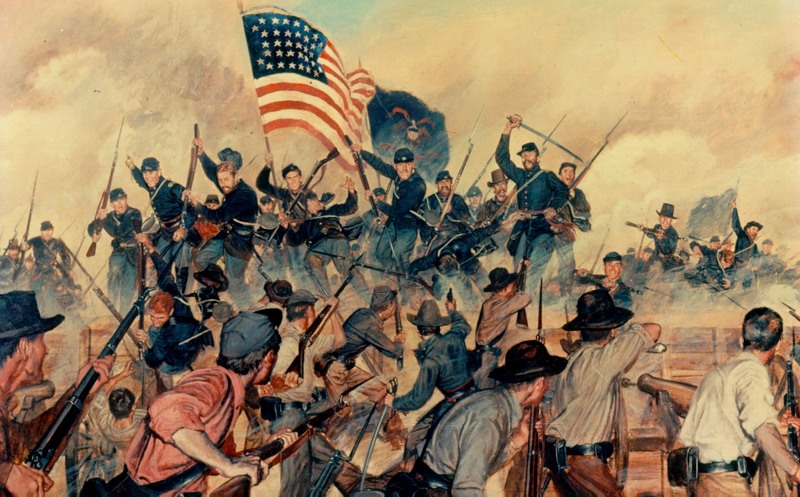 In this assault against bitter resistance the 1st Battalion, 13th Infantry, lost forty-three percent of its men, but of the attacking force, it alone fought its color up the steep slope to the top. 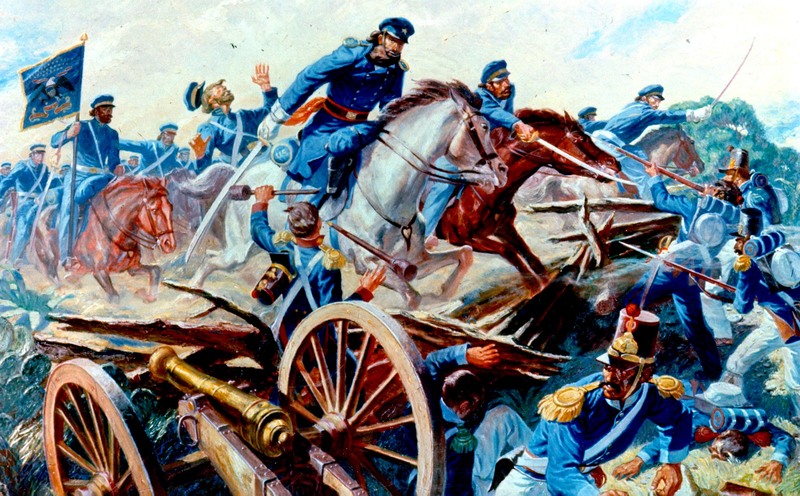 General Sherman called its performance "unequalled in the Army" and authorized the 13th Infantry to inscribe "First at Vicksburg" on its color. 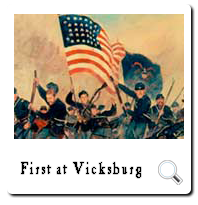 Although it took two more months of hard fighting to capture Vicksburg and split the Confederacy, no episode illustrates better the indomitable spirit of Americans on both sides. Near Fort Phil Kearney, Wyoming, 2 August 1867. 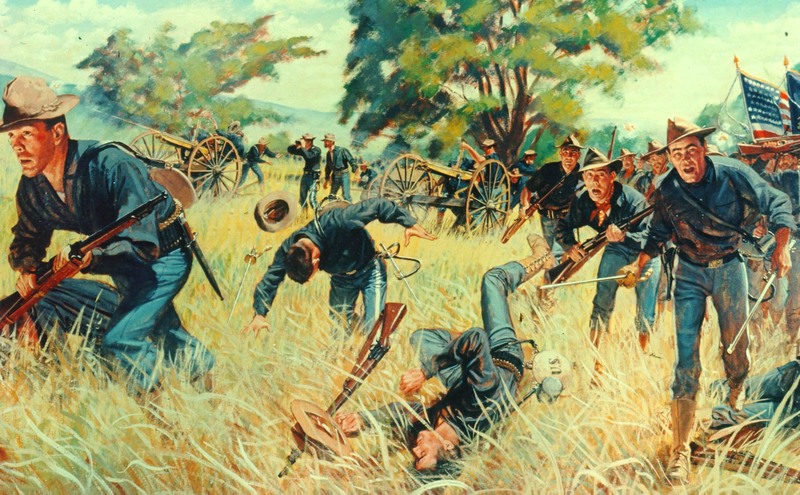 The Wagon Box Fight is one of the great traditions of the Infantry in the West. 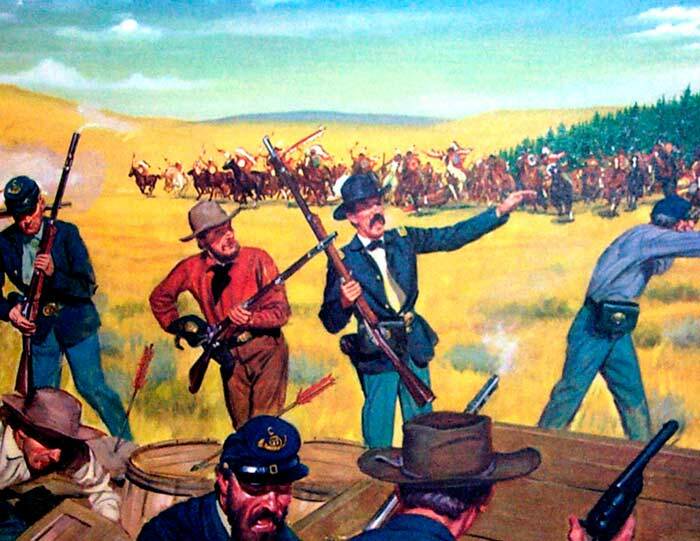 A small force of 30 men on the 9th Infantry led by Brevet Major James Powell was suddenly attacked in the early morning hours by some 2,000 Sioux Indians. 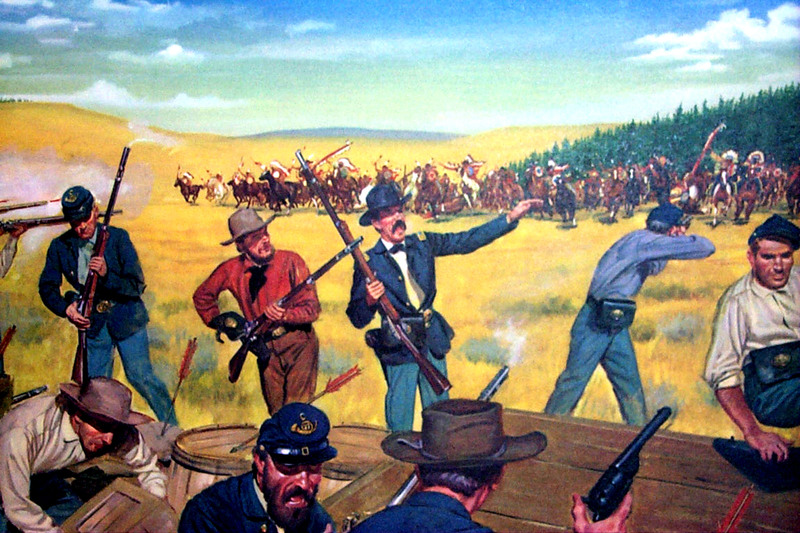 Choosing to stand and fight, these soldiers hastily erected a barricade of wagon boxes, and during the entire morning stood off charge after charge. The Sioux finally withdrew, leaving behind several hundred killed and wounded. The defending force suffered only three casualties. By their coolness, firmness and confidence these infantrymen showed what a few determined men can accomplish with good marksmanship and guts. 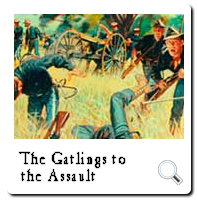 "The Gatlings to the Assault"
San Juan Hill, Santiago de Cuba, 1 July 1898. 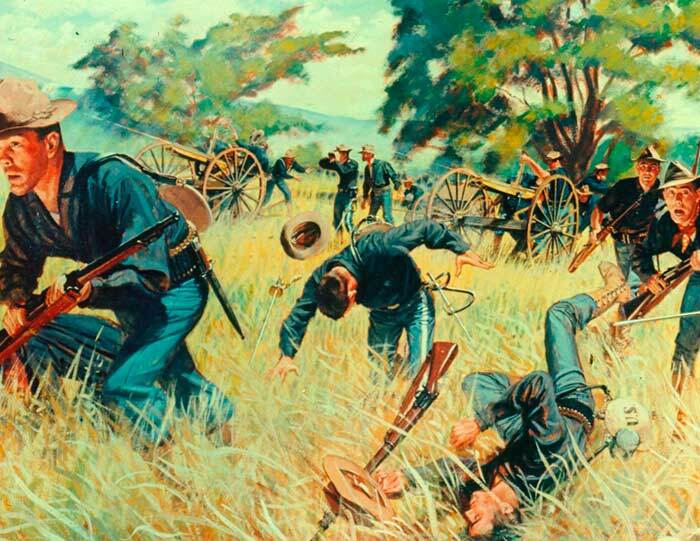 An important yet little known incident in American arms occurred during the assault on San Juan Hill in the War with Spain. The going was tough up the hill, since the Spaniards were well entrenched. Lieutenant John H. Parker was in command of the Gatling Gun Detachment composed of men from four different infantry regiments. Parker believed that his guns, which normally played only a defensive role in battle, could be of decisive importance in the attack by giving fire superiority to the infantry just when most needed. 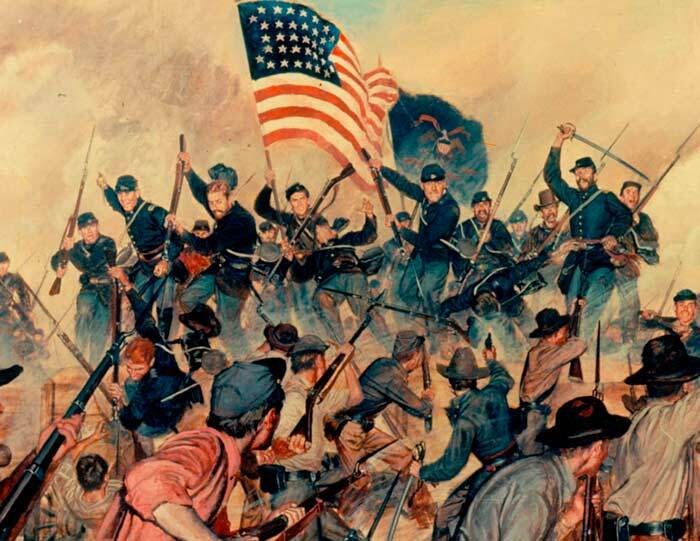 Receiving permission to advance the guns, Parker brought his detachment abreast of the Infantry, in fact ahead of some elements of it, and opened fire. This, the United States Army's first use of close support machine guns in the attack, was decisive in the capture of San Juan Hill. Lieutenant Parker's initiative developed an important principle of fire and maneuver -- the use of close support machine guns in the attack. 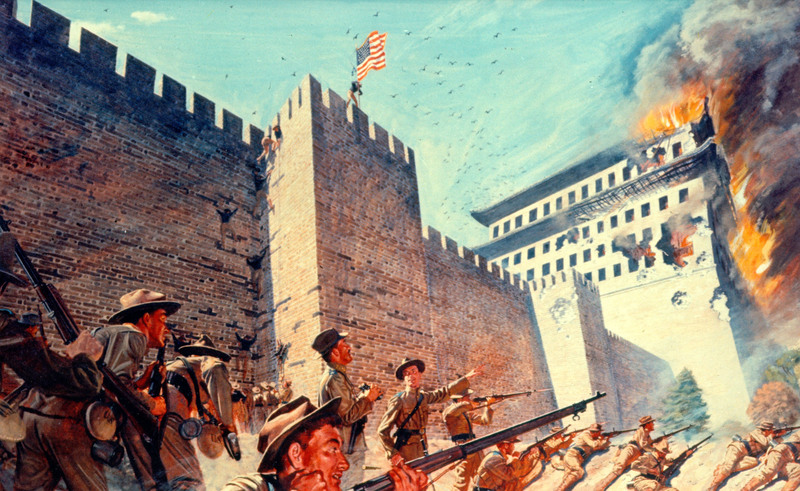 During the fiercely opposed relief expedition to Peking in the Boxer Rebellion in 1900, when two companies of the U.S. Army's 14th Infantry Regiment were pinned by heavy fire from the east wall of the Tartar City and the Fox Tower between abutments of the Chinese City Wall near Tung Pien Gate, volunteers were called for to attempt the first perilous ascent of the wall. Trumpeter Calvin P. Titus of E Company immediately stepped forward saying, "I'll try, sir!" Using jagged holes in the stone wall, he succeeded in reaching the top. He was followed by the rest of his company, who climbed unarmed, and hauled up their rifles and ammunition belts by a rope made of rifle slings. As the troops ascended the wall artillery fire from Reilly's battery set fire to the Fox Tower. 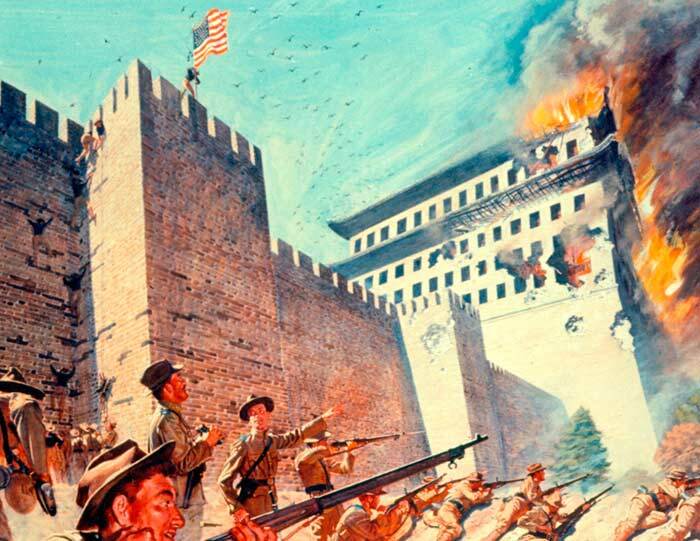 In the face of continued heavy Chinese fire, the colors broke out in the August breeze as the sign that U.S. Army troops had achieved a major step in the relief of the besieged Legations. For his courageous and daring deed in being the first to climb the wall, Trumpeter Titus was awarded the Congressional Medal of Honor. 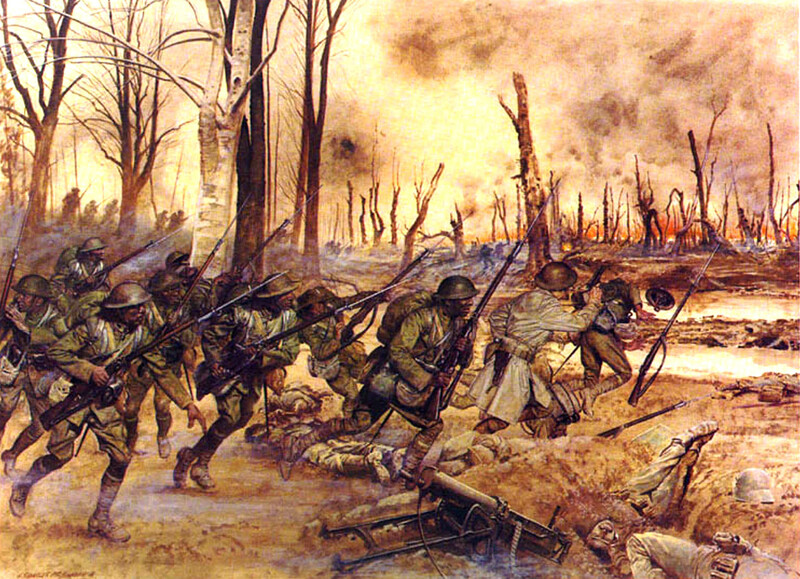 The four-day battle of Bagsak Mountain on Jolo Island in the Philippines took place from 11 to 15 June 1913. 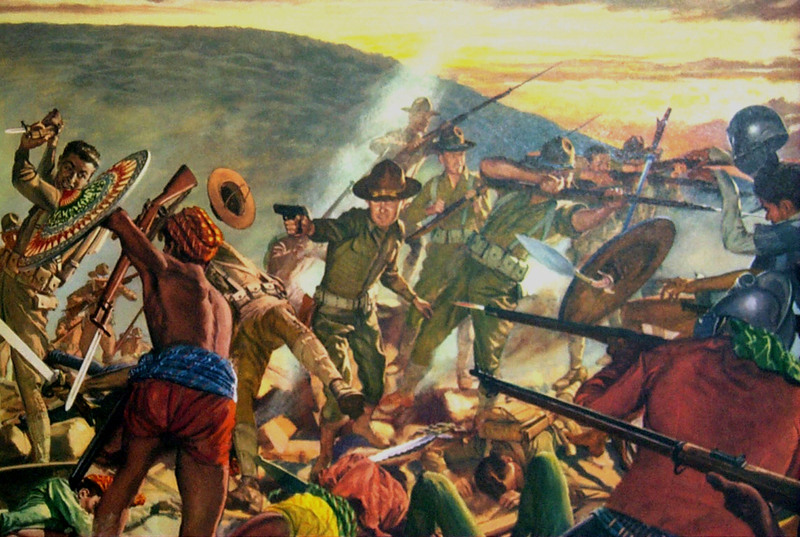 Americans of the 8th Infantry and the Philippine Scouts, personally lead by Brigadier General John J. Pershing, brought to an end years of bitter struggle against the Moro pirates. 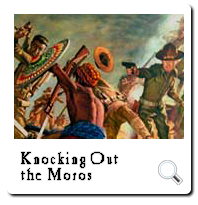 These Bolo men, outlaws of great physical endurance and savage fighting ability, were well organized under their Datus or chiefs. They had never been conquered during several centuries of Spanish rule in the Philippines. 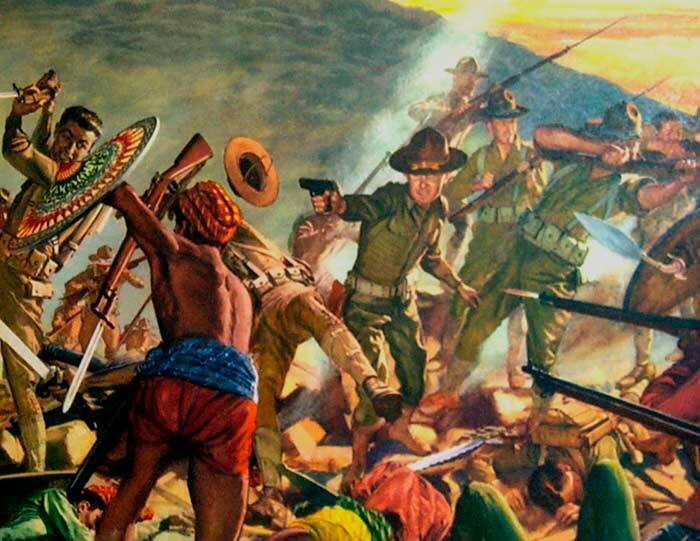 The U.S. Army .45-caliber pistol was developed to meet the need for a weapon with enough striking power to stop fanatical charges of lawless Moro tribesmen in hand-to-hand fighting. Meuse-Argonne, September 26-October 1, 1918. The 369th Infantry fought valiantly in the Allied (Champagne) Offensive as part of the French 161st Division. 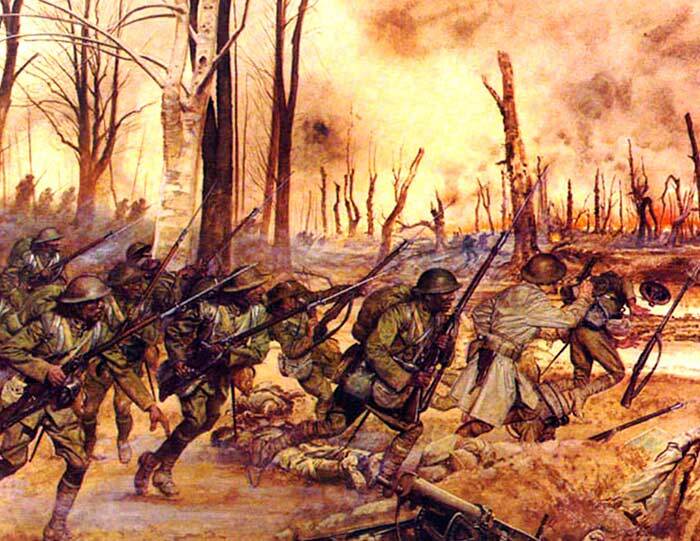 Attacking behind a fiery barrage, the 369th Infantry assaulted successive German trenchlines and captured the town of Ripont. Against determined resistance, the 369th advanced up the heights norths of the Dormoise River and spearheaded the attack toward the town of Sechault. On 29 September, the Regiment ". 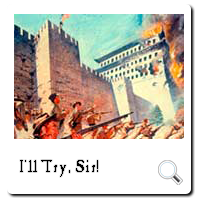 . . stormed powerful enemy positions, . . . took, after heavy fighting, the town of Sechault; captured prisoners and brought back six cannons and a great number of machine guns." 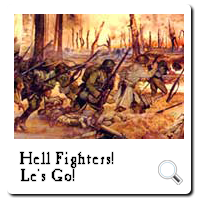 Despite heavy casualties, the 369th, called "Hell Fighters" by the French and Germans, relentlessly continued the attack at dawn. Raked by enemy machine guns, they assaulted into the woods northeast of Sechault, flanking and overwhelming enemy machine gun positions. The "Le's Go!" elan and indomitable fighting spirit of the 369th Infantry was illustrated throughout the battle action. Their initiative, leadership and gallantry won for their entire Regiment the French Croix de Guerre.